Borussia Dortmund have announced that Hertha Berlin striker Adrian Ramos will join them in the summer for an undisclosed fee. The Colombia international, 28, has scored 16 Bundesliga goals this season, only one behind leaders Mario Mandzukic and Robert Lewandowski. Lewandowski is leaving Dortmund this summer for champions Bayern Munich. Ramos, who will sign a four-year contract, joined Hertha in 2009 from America de Cali in his homeland. He has scored 32 goals in 89 Bundesliga matches and has been linked to Dortmund for several months. 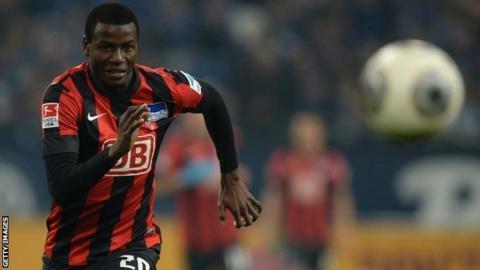 "Adrian Ramos is an excellent footballer and one of the top scorers in Germany," sporting director Michael Zorc said. "It fits perfectly in Borussia Dortmund's requirements."